Erica Wilson passed away on December 13, 2011. I am amazed that the sewing blogging world has not paid its respects. 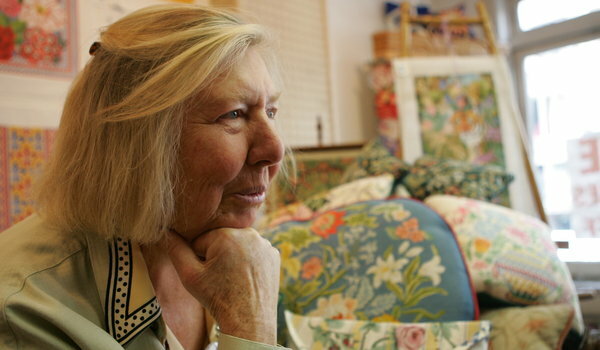 Ms. Wilson was responsible for bringing the art of hand needlework to the world. British by birth she settled in Nantucket where she taught and had a retail shop. There is much info here in the New York Times article. I spent many a Sunday afternoon watching Ms. Wilson on PBS. Her sense of color was glorious, her attitude wonderful. She wanted embroidery to be contemporary, bright, playful, and enjoyed. She published many many books teaching everything from needlepoint to goldwork to knitting and more. She inspired me to take up crewel work and I am so glad I did. There are time worn crewel items around this house that hold sentimental value for me. This crewel work was done at a very difficult time for me and while they are worse for wear, they are badges of survival for me. She was a high spot in my life at that time and took me away, although briefly, from some of the pain I was going through. I so enjoyed her television program and books. 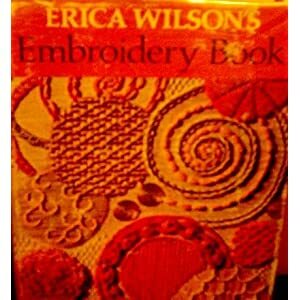 If you are at all interested in embroidery, or the use of color in needlework, or just want to see some inspirational work, check out her books. You will learn a lot. The sewing world truly lost a great one with her passing. I DO remember her, and loved her books very much. A agree with you Bunny - her use of color and playful patterns was superb. Thank you for alerting me to her passing. Thank you for the alert, and the link to the obituary...worth reading for the last line alone! I hadn't heard about this. I do remember her show from many years ago. Her work was beautiful. I had not heard of this lady until your post. What a wonderful person she was. Thank you for posting this and drawing her to people's attention. My thoughts go out to her family. I, too had not heard that she had passed away. I knew of her and enough about her to recognize the name in the title of your post. I'm sure her passing is a great loss to the needlework community. I remember her well. I have a framed needlepoint of Nantucket harbor I did a million years ago and an equally old canvas of a map of Nantucket that still has only about 3 stitches in it, in my project stash. I've even forgotten how to do needlepoint since then. Did you ever go to her little shop on Main St on Nantucket? So magical. I still have one of her books. She was an inspiration. I had not heard of her passing. Thanks for bringing to our attention. I have a couple of her books. She was a very inspirational and creative person. I do remember Erica Wilson, Bunny. In fact, my husband worked as her yardman decades ago when he was spending a college summer in Nantucket. He said she was VERY exacting and that he spent a lot of time digging up and replanting flowers! I too remember her. I still have one of her books. She inspired me to cover my jeans with colourful hand embroidery back in the day --- I was a teen. I still remember sitting on the front porch embroidering a spider's web on my knee, while wearing the jeans. Yeah I was a sewing nerd at an early age. I do remember her although I don't recall ever being fortunate to see her on tv. I had a book or two of hers and stitched some of the projects. We did see a small notice of her stitching in our local newspaper out in California! I hadn't heard anything about her in years so the notice was surprising. How can it be that I have never even heard of her? I've never seen a single program of hers on our PBS. Of course, we're not even getting Martha P. at the moment. Grrrr! I will check out our library for some of her books right now. Thanks for telling us about her, Bunny. Bunny, I own Erica Wilson's book, "For The Baby", published in 1991. It was given to me by a friend who no longer wanted it. It is one of my very favorite books. The book has clothing and accessories for babies and children and includes sewing, smocking, knitting, crochet, cross stitch, stenciling and more. It is photographed in Nantucket and I believe the models include members of her family. There are four darling babies on the cover in smocked bubbles and dresses. Such a treasure! !